There is surprisingly little to report back this morning. Moved the last of my stuff from Bean's house yesterday afternoon. Which thankfully was not as emotionally draining as it was on the weekend. And I was pretty nervous to go back there after how I felt for the rest of Sunday. So today I'll be going back to leave my keys and whatnot and do a final once-over. And that will be that. Strange. A whole chapter of my life over. Blegh, I can't think about that right now. 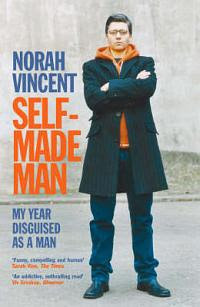 So anyway, during the weekend while spending vast amounts of time trying to avoid my brain, I finished Norah Vincent's Self-Made Man. Norah Vincent's witty and compulsively readable memoir tells how she dated women, joined a bowling league, visited strip bars, retreated to a monastery, got a job in sales and even infiltrated a men's therapy group. Norah did not predict how crucial the relationships Ned forged would be and how the burden of being an impostor would became almost too much to bear. The result is a constantly surprising and humane account of what it is to be a man - and a woman - in the modern world. It was a fairly interesting read. I read some really bad reviews from guys on the Amazon site, but was curious to read it non the less. I believe in making up my own mind about books & movies. Anyway, I think it the whole concept of what she set out to do is novel and whether or not you agree that she discovered the truth about men & how they interact and just how different that is from us girls, well that's up to you. It's not a scientific thing at all, it's all about her personal experience and interactions. And she certainly put herself in some interesting places, like a monastery! So, if you're curious, I suggest you read it otherwise, leave it alone.